Sloane Stephens entered the 2017 U.S. Open unseeded. Saturday marked the first time since 1998 that the women’s draw at the U.S. Open was won by an American not named Serena or Venus. Sloane Stephens, who was ranked 957th in the world in July and entered the tournament unseeded, beat fellow American (and good friend) Madison Keys handily, 6-3, 6-0. Stephens, Keys and CoCo Vandeweghe, all of whom made at least the semifinals at this year’s Open, are all 25 years old or younger and have tons more tennis to play in their primes. Could they be the players who finally take the torch carried so long by Serena and Venus Williams? Before Thursday, it had been 36 years since every player in the semifinals of the women’s draw at the U.S. Open was an American. And before Saturday, the last American not named Williams to lift the U.S. Open trophy was Lindsay Davenport, who dominated the game from 1998 to 2000, finishing the 1998 WTA season as the top-ranked player in the world and nearly collecting a career Grand Slam over the course of just three seasons.1 The Williams sisters’ dominance notwithstanding, American women have had a rough go of it at the U.S. Open — and have seen less success at every other major as well — during the past two decades. But that wasn’t always the case. During the first 20 years of the “Open era,”2 the women’s draw at the U.S. Open saw 15 champions from the U.S. It took American women three years to capture their first U.S. Open title in the Open era (Virginia Wade of Great Britain was the first to lift the trophy, in 1968, and Australian legend Margaret Court, who along with Billie Jean King is the only woman to win the U.S. Open in both the pre-Open era and the Open era, won in 1969 and 1970). But after that slow start, American women won 15 of the next 17 titles. King won in 1971, 1972 and 1974 (her last time) before passing the torch to Chris Evert. This American pre-eminence carried over to the other majors as well. From 1971 to 1987, U.S. women won at least one major in each season.5 And from the beginning of the Open era through 1984, 12 different Americans made it to at least one Grand Slam final (and five of those 12 won at least one Grand Slam). The parity that once existed in U.S. women’s tennis dwindled a bit in the years that followed Navratilova’s final title at Wimbledon, in 1990 — at least in terms of the number of players who made it to a Grand Slam final. In the subsequent 27 years, just nine Americans have made at least one Grand Slam final. But of those nine, six have gone on to win at least one Grand Slam. Before Stephens did it on Saturday, the last American not named Williams to lift a trophy at a major was Jennifer Capriati, who knocked off Martina Hingis at the 2002 Australian Open. 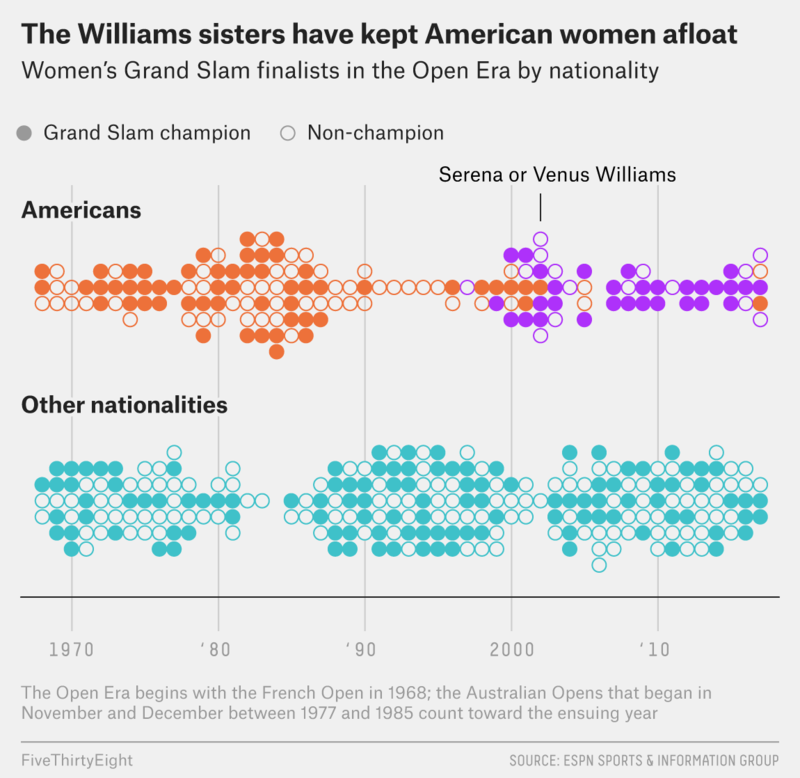 Fifteen years is a huge gap in parity, but the work of the sisters alone in this period — particularly Serena Williams, who won 23 titles — still meant that this would go down as one of the most dominant eras of American women’s tennis. The pair have won 30 of the last 75 finals and have combined for eight U.S. Open trophies. In the end, it’s fitting that the final major of the 50th season of Open-era play would go to an American — of the 199 majors contested over that span, 85 have been won by an American, by far the most of any country. And if Stephens, Keys and Vandeweghe have anything to say about it, that number should only grow. And above all, parity in American women’s tennis appears to be on the upswing again. Davenport now coaches Madison Keys. Not a bad influence to have in your box. The Open era began in 1968 when the French Open decided to allow professionals to play alongside amateurs. Helen Wills Moody — also an American — still holds the all-time record, with seven titles. She lost in the 1985 U.S. Open final to Hana Mandlíková. 1988 and 1989 were busts for anyone in women’s tennis not named Steffi Graf. In 1988, Graf asserted herself as the best tennis player on the planet by winning all four majors — and Olympic gold. In 1989, she won three of the season’s four majors.